Caption slip reads: "Negs. to Goodnow. Photographer: Lapp. Date: 1958-04-08. Reporter: Kay W. Assignment: Mothers day at juvenile hall. 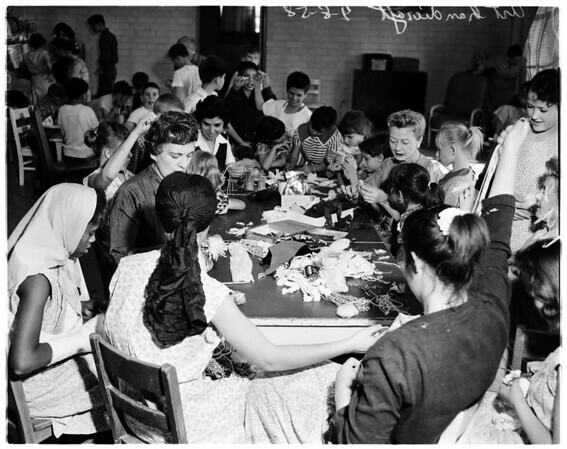 25/26: Mrs. Hugo Divi, Council Juvenile Hall, chairman Art hand craft. 59/60: Mrs. Henry Auerbach, playing piano and singing. 41/42: Mrs. Benjamin Kapp, Sect. VP, Community Welfare Services. 13/14: Mrs. James Feuerstein, bending. 19/20/23: Art hand craft. 11/12: Mrs. Benjamin Barron, making Lanyard inst. ".